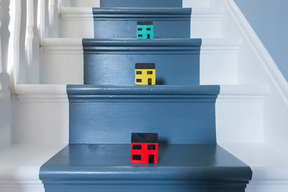 Saving a cash deposit isn’t the only way to get your foot on the property investment ladder. Investors now have a number of options that allow them to get into the market. If you think that you’re locked out of the property investment market, here are 5 options that may help you break through and get your foot on the ladder. Typically, the easiest way to buy your first investment property is to refinance your existing home loan. This will release the equity within your home, which you can use to buy an investment property. Put simply, the amount of equity in your home is the difference between the value of the property and the debt owing on the property. For example, if your property is worth $500,000 and you owe $240,000 on the mortgage, the difference (or equity) is $260,000. What most people wrongly assume, though, is that this is how much a bank will lend you. In reality, a bank will lend you 80% of the total value of the property (80% of $500,000 = $400,000) less the existing debt on the property ($240,000). So, in this instance, a lender would provide $160,000 which you can use as a deposit to buy an investment property. If you don’t have a sufficient deposit, or you can’t access equity in your home, then you may want to consider lender’s mortgage insurance (LMI). Effectively, LMI allows investors to borrow 80-95% of the cost of the investment property with a smaller deposit. LMI costs about 1-3% of the value of the loan and increases the higher the loan-to-value ratio (LVR). So, if your LVR is 95%, the cost of LMI will be higher than a 90% LVR. It’s important to understand the costs involved as it may be a better option to continue saving until you have a sufficient deposit and you don’t need to use LMI. Residential development syndicates can be a good option to get your foot on the property investment ladder as they require significantly less capital outlay compared to direct property investment. Depending on the company managing the syndicate and the type of syndicate, the minimum investment can typically range from $10,000-$50,000. This is significantly less than the 20% deposit required on direct residential property investment, which for a $500,000 property means you’d need $100,000 deposit, plus costs of stamp duty etc. A residential development syndicate would typically provide returns of between 40-60% over a 2-3 year investment term. Be aware that development carries risk and it is a riskier investment than a traditional property investment. Investors may also want to consider commercial property trusts, which offer annual returns of 6-8% plus capital growth over a 6-10 year investment term. Commercial trusts are typically more suited to established investors who are nearing retirement and want cash flow rather than capital growth. If you can find someone with equity in their property, they can act as a guarantor for your loan. Typically, a guarantor will be a parent who uses their home as security for your loan. You will still need to borrow the full amount but may avoid LMI if the value of the security reduces the LVR to 80% or below. The guarantor can be released from the loan when the investment property rises sufficiently in value. If none of the above are possible, the best way to get your foot on the property investment ladder is to save for a deposit. Saving can be hard, particularly if you’re renting or paying a mortgage, but it can be made easier by creating and sticking to a budget. Your household budget should detail your income and expenses to determine how much saving capacity you have each month. It’s important to make a budget realistic because if you can’t stick to it you’re only setting yourself up for failure. Allocate money each month for utilities (gas, water, power bills etc), transport (public transport, car registration, petrol, maintenance etc), food, clothing, entertainment and other expenses. Look at areas where you can make savings as well as compromise, for example instead of eating out for a weekend breakfast eat at home but go out for a coffee, instead of going to the movies every month buy a Netflix subscription etc. Determine how much you can save each month and set yourself a target. It might also be worth considering investing in other locations if your city is too expensive.